On Aug. 3, 1938 Arthur Chin led a group of seven Gladiator biplanes from the Chinese Nationalist air force’s 28th Pursuit Squadron against a formation of much more advanced Japanese A5M fighters. In the sky over China’s Hubei province, Chin fought off several of the A5Ms. His own aircraft took fire from the rear. Luckily for him, one of his aircraft mechanics had salvaged a piece of armor plating from a wrecked I-15bis fighter and installed it behind his seat before the mission. The plate likely saved his life. Chin would later recall hearing shells ricocheting behind him. Sensing heavy damage to his mount, Chin concluded that his fighter was beyond saving. He decided to ram the closest enemy fighter. By a stroke of luck, he was able to both strike his target and bail out of the doomed plane. His actions that day would make him a legend to fellow pilots, but few Americans have heard of Chin—even though he’s now considered the first American fighter ace of World War II. Born in Portland, Oregon to a Chinese father and a Peruvian mother, Chin was part of group of oft-forgotten Chinese-Americans who volunteered for duty with the Chinese Nationalists to fight the Japanese Empire. Their exploits have largely been overshadowed by Gen. Claire Chennault and his much more famous First American Volunteer Group, better known as The Flying Tigers, which arrived in China in 1941 flying Curtiss P-40s. Motivated by Japan’s invasion of Manchuria, in 1932 Chin and other 13 young Chinese-Americans enrolled in the Al Greenwood flying school in Portland with plans to fight for their ancestral homeland. Flight school was expensive, so the local Chinese community paid many of the young men’s tuition and fees. Chinese officials initially greeted the recruits with suspicion. Despite their Chinese faces and surnames, the Chinese in China considered them deeply foreign. Most of Chin’s group managed to join the Canton Air Corps of Guangdong, a provincial air force under the command of warlord Chen Chidang. In May 1936 Chen revolted against the central Kuomintang government of Chiang Kai-shek. Worried that more infighting could be exploited by the Japanese, most of the Canton Air Corps defected to the Kuomintang air force. The Cantonese pilots flew their planes to KMT airfields. Deprived of its air cover, Chen’s rebellion quickly collapsed. The American volunteers were now members of the air force they’d originally hoped to join. That same year, the Nationalist air force selected Chin and several other pilots to go to Germany for additional training at the Lager Lechfeld airfield in Bavaria. At the time, Nazi Germany was a key ally of the Kuomintang and provided most of its weapons and arms. Upon returning from Germany in early 1937, Chin became a flight instructor. In June he was assigned to the 28th Pursuit Squadron as vice squadron commander under the leadership of fellow American pilot Capt. Chan Kee-Wong. 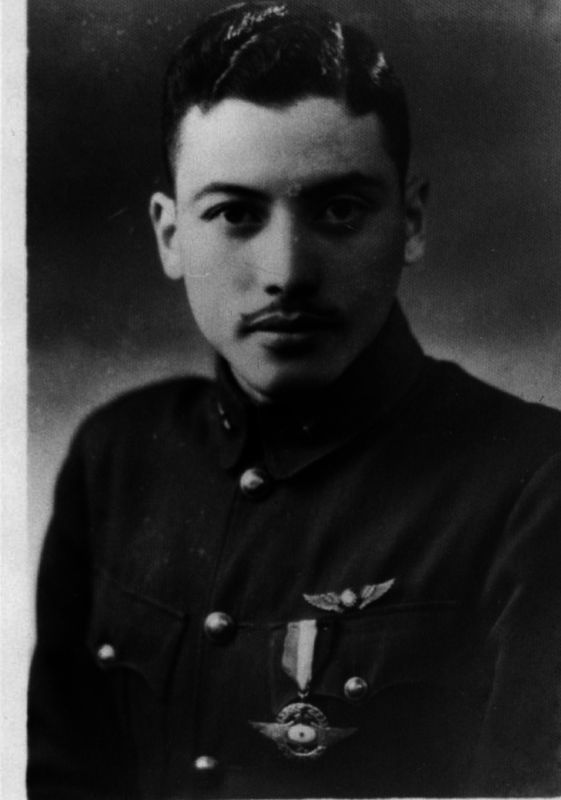 Chin took up his position at the 28th around the same time Chennault arrived in China on an initial three-month contract to survey the Chinese air force. Chennault’s survey was hardly hope-inspiring. The Chinese planes often lacked spare parts. Many of them were older biplane models that were quickly becoming obsolete as the world’s air forces introduced faster monoplanes. A tensions with Japan mounted, it seemed increasingly likely this ragtag force would have to fight against one of the world’s most advanced air forces. Despite the gathering storm, Chin found time to enjoy the nightlife. He married a Sumatra-born ethnic Chinese woman named Eva Wu. On July 7, Japan’s Kwantung Army marched into northern China. On Aug. 10, the 28th Pursuit Squadron reported for duty at the Chuyung airfield near the Nationalist capital of Nanking. Chin shot down his first enemy plane — a Mitsubishi G3M2 twin-engine bomber — on Aug. 16 while flying a Curtis Hawk II. The Hawk II was a biplane with an open cockpit. The G3M2 was a modern all-metal monoplane with an enclosed cockpit and defensive rotating turrets. Chin and his compatriots would continue to fly missions against much better-armed opponents. After he ditched his plane on Aug. 3, a local farmer took him. Chin and the farmer went to the crash site to see what they could salvage, and to both their surprise found a seemingly undamaged machine gun. With the farmer’s help, Chin managed to reach a Nationalist base. Chennault—who had by then become Chiang’s chief air advisor—flew to the base hospital to visit Chin. As the two talked, Chin told Chennault he wanted a mechanic to install the recovered machine gun on his next plane. He would fly dozens more missions and score eight victories in total, all of them while flying biplane fighters. On Dec. 27, 1939, Chin escorting three SB-2 bombers flown by Soviet crews on a mission against Japanese positions near Kunlun Pass in Guangxi Province. Chin shot down a Japanese A5M fighter that was attacking a friendly I-15bis fighter, but he took another a critical hit from a second A5M fighter. He successfully bailed out, but suffered serious burns on his face and other injuries. While recovering, Chin stayed with his family in a small house on Liuchow airfield. Just two days after his return, Japanese bombers attacked the base. Chin’s wife Eva took the children to the air-raid shelter first then went back for Chin. As bombs fell, Eva threw herself on top of Chin to protect him from shrapnel. Eva died. Chin lived. “I held her dead body to mine until help came,” Chin recalled. Chin traveled to neutral Hong Kong with his kids for treatment. They narrowly escaped capture when Japan invaded the British colony in December 1941. His escape route took him through India and Africa before he finally arrived in New York City. He received skin grafts in the United States. In 1944 Chin was officially discharged from the Chinese air force. He quickly joined United States Army Air Forces. His final wartime assignment was to fly supplies over “The Hump” between India and China. After the war he flew for the China National Aviation Corporation until the Chinese civil war forced him to flee back to the United States in 1949. He settled in Portland. Chin failed to get work as a pilot in postwar America. He ended up with the U.S. Postal Service, instead. A month after Chin died in September 1997, he was posthumously inducted into the hall of fame at the American Airpower Heritage Museum in Midland, Texas. The museum recognized him as the first American ace of World War II. In 2008, Democratic congressman David Wu of Oregon introduced House Resolution 5220 to name a post office in Aloha, Oregon the “Major Arthur Chin Post Office Building.” Congress approved the resolution and George W. Bush signed it into law.